Garage World Townsville custom design a solution to suit your requirements, featuring Colorbond steel colours and modern, independently engineered designs that meet Australian standards. 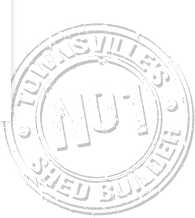 When you build with Garage World Townsville, you deal directly with licensed builders and qualified tradespeople who will manage your project from free initial quotation and planning to Council approvals and final construction. Investing in custom designed sheds comes with many benefits, but the most important generally have to do with the suitability and flexibility of custom designs. After all, there's no point in building custom designed sheds if they don't deliver what you're looking for. How you plan on using your custom designed shed should determine its size and shape. For instance, commercial sheds used to store equipment will likely have different requirements than sheds used as workspaces. Other building considerations, such as doors, windows and ventilation, will also need to be taken into account. With custom design, you can ensure you have the right space for the right job. This is part of the Garage World difference. In addition to how the shed will be used, it's vital to ensure your custom designed sheds are suited to your building site. Different sites will come with unique building requirements, influenced by everything from local regulations to the slope of the land. The talented designers at Garage World will work with you every step of the way to make sure your commercial sheds not only fit how you plan to use them, but where they will be constructed. While practicality is likely at the forefront of your mind, there's nothing stopping you from building sheds that are attractive as well as functional. Here at Garage World, we're dedicated to quality craftsmanship. This means constructing custom designed sheds that will not only stand the test of time, but also add value through appearance. Part of this is our commitment to using only premium-quality materials. Another factor is our devotion to working with clients every step of the way, from design to construction. This ensures you're always up to date on how the finished product will turn out. Ready to start building and improve your lifestyle? See our examples and talk to the carport specialists at Garage World Townsville or apply now for a FREE online quote and let us help you add value and style to your home or commercial property.